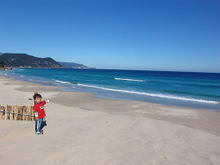 Today it was very warm so my son, Yuuki, and I went to the beach. After getting to "Shirahama Chuou Beach" which is next to Shirahama Ohama beach, we got into the beach and started to walk together. When we were walking on the beach we found some branches of the tree and drew a big picture on the big cambus of the sand. At that time my son found something in the sky …… . This entry was posted in beach, Family, nature on 2006年11月29日 by izusakuraya. How do you like this photo ? I took this out of entrance of our Pension. 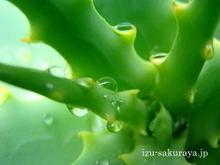 We had sometimes rain today, so that the leaves of aloe had the water drops. When I saw this tree from a distance I couldn’t know that this tree had these water drops, but I was surprised very much and pleased with it. This entry was posted in Flower, nature, Pension Sakuraya on 2006年11月27日 by izusakuraya. Our Pension is on a hill but we could hear the sound of the sea today. 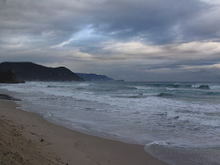 When I went to the school to pick my children up I went to the beach to check it. It was cloudy and had big waves today. I was wondering that there is nobody on the beach, but ….. 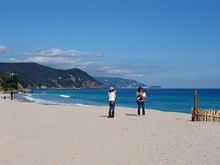 This entry was posted in beach on 2006年11月20日 by izusakuraya. This month is our two daughter’s birthday and it is only 4 days which is difference of their birthdays. So their birthday party take place on same day in November when we can do it every year. Tonight’s nemu are grilled lobster and fried chicken. We usually serve this lobster for our guest’s dinner but we had never eaten it for our meals until now. As my daughters recently say that they want to eat it, we cooked it for their birthday tonight. Tonight’s menu were only these 2 dishes because they want to and have to eat a birthday cake after dinner ! Their birthday cake is ……. This entry was posted in Family on 2006年11月14日 by izusakuraya. Today a small music consert took place at Shirahama elementary school, so my wife, my son and I went to see it. 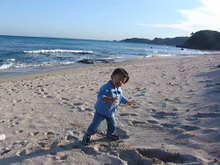 After that, when my wife went to "Family Mart" in front of the beach my son and I went to the beach. We could see a family with small baby and they are taking a picture. I guess that their baby is a first child, so everything is fresh for them with new baby. This entry was posted in beach on 2006年11月13日 by izusakuraya. Now I am writing this weblog at 11:30 in the night. It is very cold outside, so I can not open the window tonight. Today we had a strong wind from west and there were some ships in the sea. 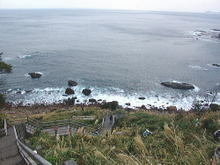 Yes, this is a tipical scenery of winter in Shimoda. That ship is staying in this area until the strong wind will stop. Because they have very strong wind at the southmost area of Izu peninsula today and it would be 30 meters per minutes or more. They can not go through this area because of its danger. 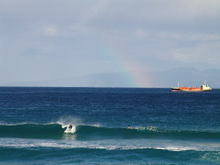 By the way, when my wife and I went to Shimoda we found the rainbow. It was raining over that ocean, I guess, but in Shirahama …….. This entry was posted in beach, nature on 2006年11月12日 by izusakuraya. "What’s that, Yuuki ? " 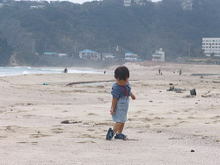 Before going to Shimoda for shopping we went to the beach and asked my son. Then he answerd me so. "That’s very beautiful sea, right ?" Today’s Shirahama beach was really excellent. …. This entry was posted in beach, Family on 2006年11月9日 by izusakuraya. I went to Shimoda train station today. I have ever been there a lot of times, but I have never show this. 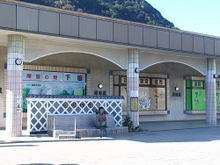 This is Foot Spa in front of Shimoda station building. This spa is free of charge and opened for 24 hours. The capacity is about 4 people, so it is not big, I think. If you go to Shimoda by train please try it once. Besides I show you the view from this spa. ….. This entry was posted in Travel on 2006年11月9日 by izusakuraya. Today we, the members of Shirahama Tourist association cleaned up the field of Aloe at Itado area in Shirahama. Because we have "Aloe Festival " in this area from December 9th. To clean up this field we got into the Aloe trees and cut the weeds. It was cloudy today but it became a little hot for us cleaning up this area….. This entry was posted in nature, Travel on 2006年11月7日 by izusakuraya. It was sunny in Shirahama yesterday, but was almost cloudy today. As I had to go to the small citizen hall in Shirahama I went there with my son, Yuuki. We walked on the beach for a while after that. 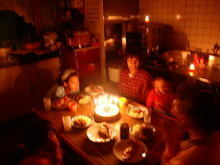 This entry was posted in beach, Family on 2006年11月6日 by izusakuraya.